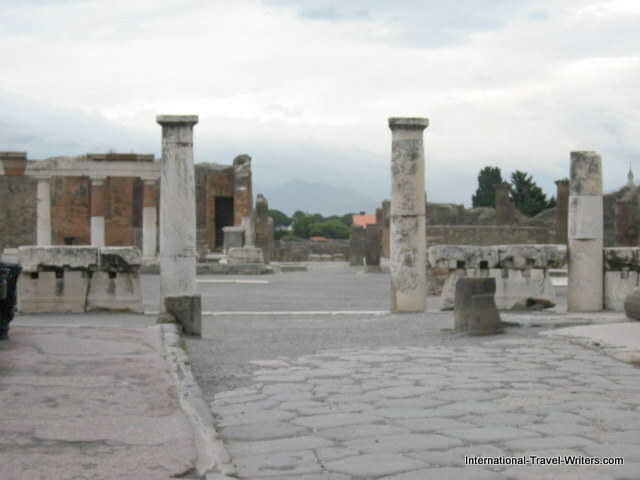 Pompei was fascinating but it was unfortunate that on the day we were visiting the area the skies were cloudy. It was also windy and heavy rain was forecast. Our guide hurried a little more than he might of if the weather had cooperated. However, it was still a pilgrimage into the distant past. 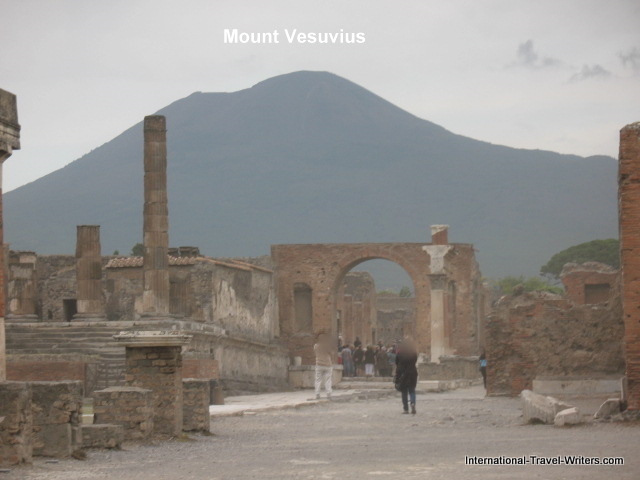 The city is located near modern Naples, was buried under 13-20 feet of molten ash and pumice during the eruption in 79 AD of Mount Vesuvius which was only 7 miles away. It is estimated that the volcano blew fire and pumice into the sky for over 24 hours and then the lava and the ash rained down on them for over 6 hours. 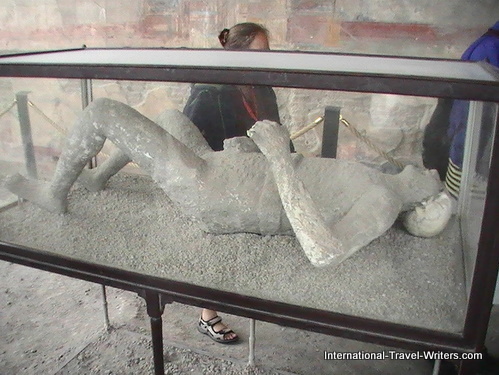 Pompei was mummified…as was its sister city a few miles away, Herculaneum. It was lost for nearly 1700 years until the accidental rediscovery in 1749. It was previously thought that the populace died of suffocation from the ash but a new study published in 2010 shows that the heat was around 250 degrees centigrade. This heat radiated for about 6 miles from the volcano so it is now believed that the heat was sufficient to cause instant death, even to those seeking shelter in buildings. 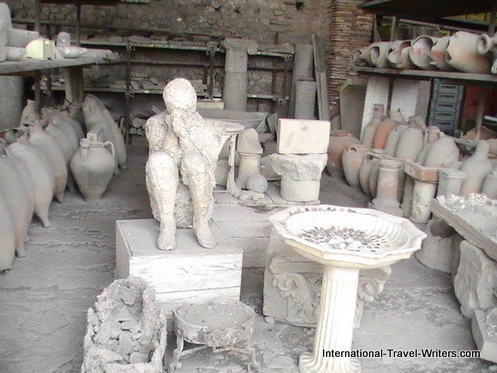 Since that time, excavations have revealed a very detailed insight into the lifestyles of the occupants of Pompei at the height of the Roman Empire’s glory days. The ruins reveal the character of the occupants and their pastimes by revealing numerous taverns, baths, shops and brothels. The Italian name of the city is actually spelled with only 1 letter i not 2 as we frequently see in the USA. 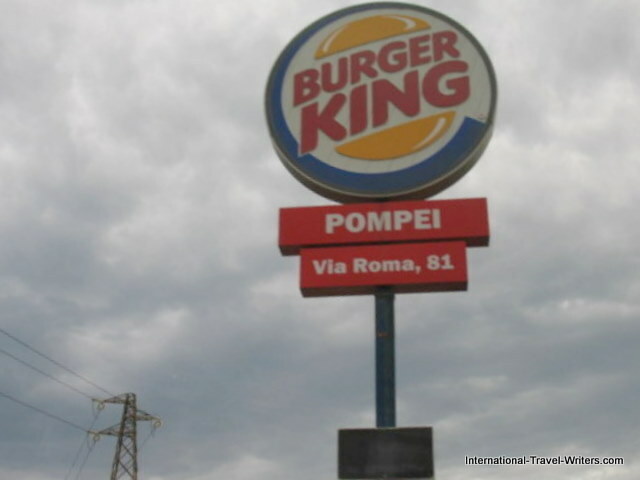 Please note the photo of the Burger King sign which spells it correctly. The most phenomenal revelation that strikes you as you meander through the ancient streets and into the dwellings that have been unearthed……is the longevity of Roman construction. It is evident in many places in the world by some remaining aqueduct structures and guard towers, to name a few, but the sheer volume of houses and baths etc. 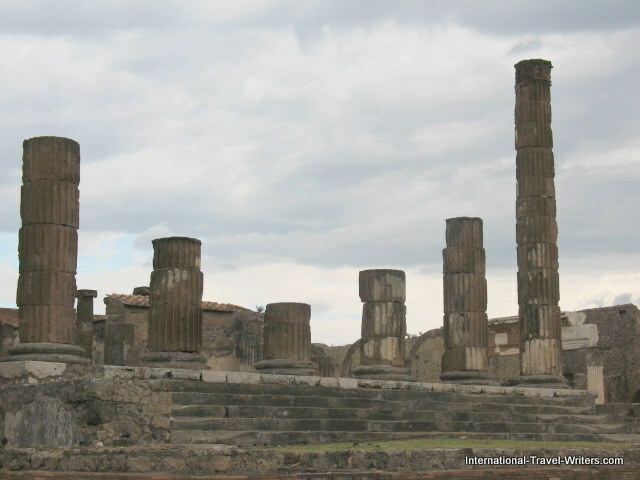 in Pompei is awe-inspiring. Much of the history regarding the events of the eruption was written years later by Pliny, the Younger. He watched from across the bay of Naples at Misenum where ships of the Imperial Navy were stationed. Pliny, the Elder was Admiral of the fleet and he ordered the ships to cross the bay to assist in evacuation attempts. However, he died while attempting to rescue stranded victims. There was speculation that they had a preview of what was to come when in 62 AD there was an earthquake and some buildings crumbled. 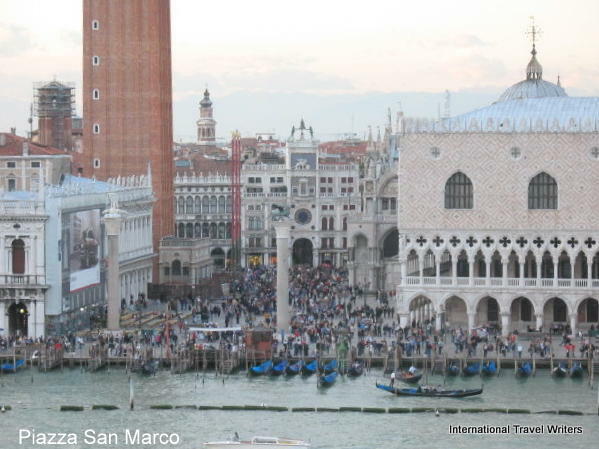 Today this is a UNESCO World Heritage Site that attracts several million visitors each year. Above is the photo of the unearthed Temple of Jupiter in Pomei. There were numerous holes dug into the Pompei ash over the millenniums but it was found later, during early excavations of the site that there were occasional voids in the ash layer. 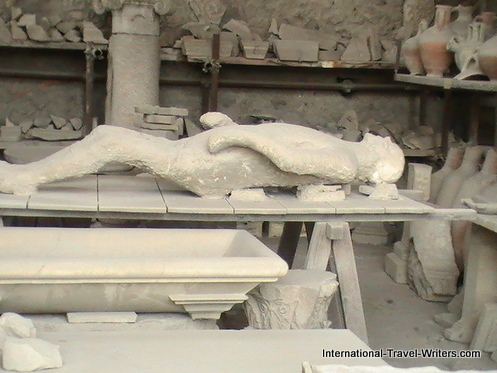 It was Fiorelli, in 1960 who realized these were spaces left by the decomposed bodies and so developed the technique of injecting plaster into them to recreate the shapes of the victims. They still use this method today except that they now use a clear resin instead of plaster because it is more durable and it doesn’t destroy the bones. 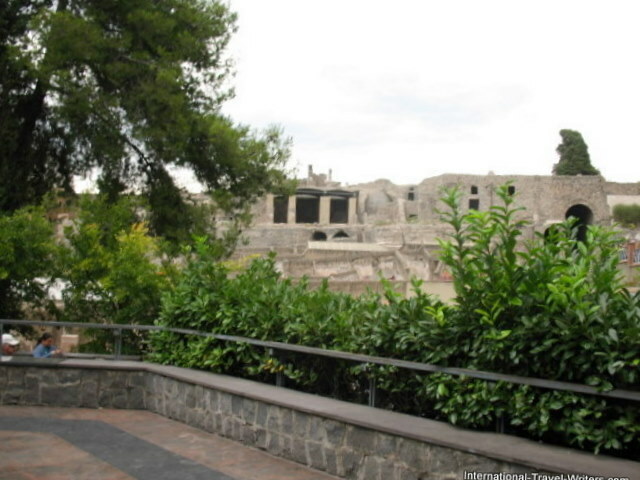 Roman baths were important in most of the ancient Roman cities and Pompei was no exception. The Forum Baths were excavated in 1823. The baths even had a heating plant and the baths were actually done in two sections…one for women and one for men. 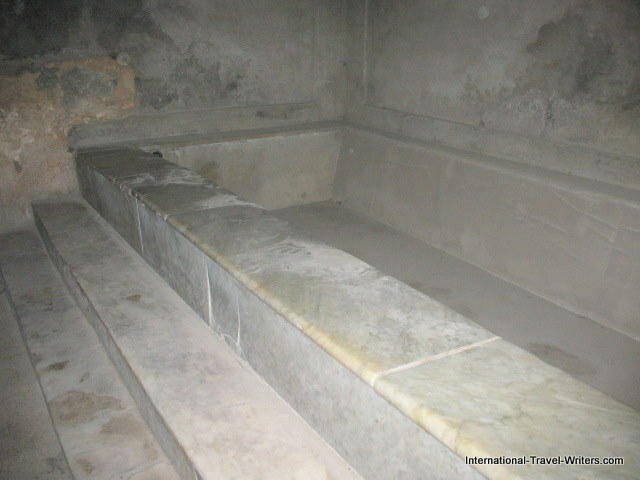 We visited the men's baths but the female baths were still being restored at that time. I have recently read that the women's baths opened in early March 2012. Excavations have revealed four public baths, not all are restored yet. 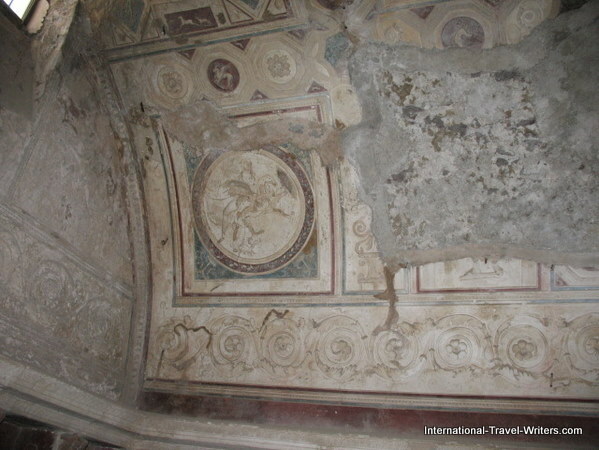 The walls still have frescoes that have a lot of detail that time has not yet erased. This photo is the upper wall part leading to the ceiling. 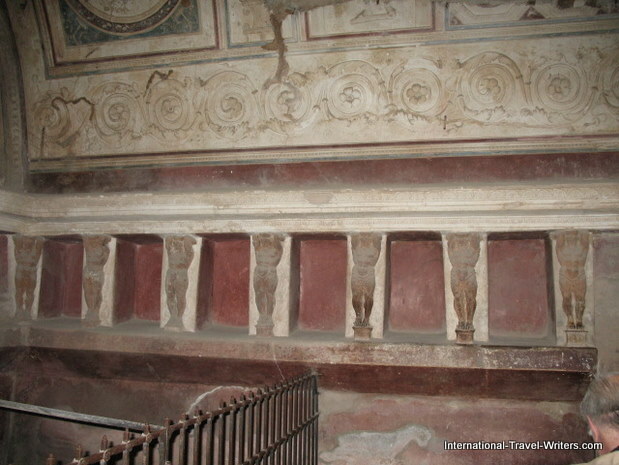 Around the walls were niches for statues and spaces for keeping personal items such as coins or oils. 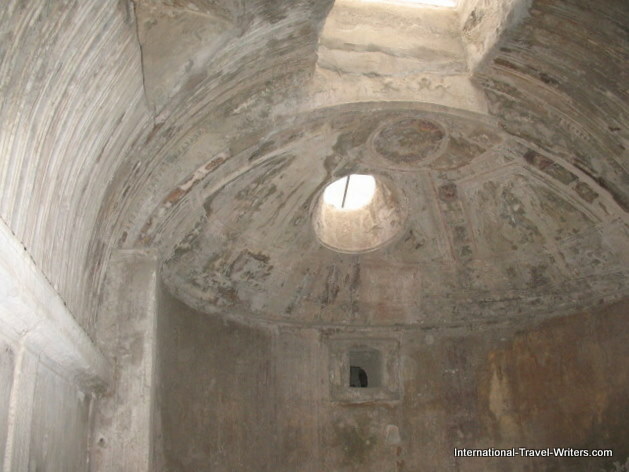 The dome over the central bath was an ingenious design to not only allow light in through a rectangular opening but also had a circular hole for steam to escape. 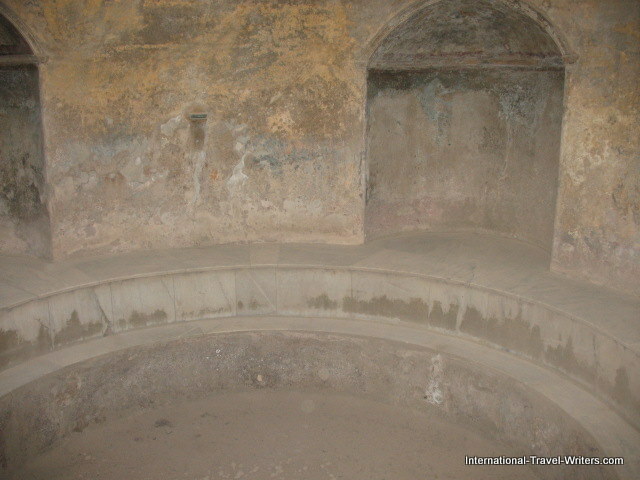 There were various baths for the city residents to enjoy. There were cold baths and warm baths. They also had a Calidarium for steam baths that was heated through a system of ducts in the walls that carried heat from their heat plant.